#SawGerrera needs to breathe oxygen...he’s a #LightSide version of #DarthVader. How the #Frack did they make that guy look just like #Tarkin? #Wampa sighting. They’re pretty good in a fight. Why don’t they let the pilot steer the ship instead of K2SO? “The time to fight is now.” #JynErso Yes! “There is no Rogue One.” There is now. The #DeathStar can jump to #Hyperspace? That’s new. The #ShieldCrash scene is spectacular. This mustached #XWing pilot is boss. These #TIEFighters are as thick as mosquitoes in #Alaska during summer. I see a pale #DeathStar rising. Final analysis: an effective “bridge” adventure leading up to #ANewHope that succeeds by taking risks. Though weak on character development, the #Dune style planet-hopping & intense action scenes compensate. 2 1/2 out of 4. A unique, stand-alone chapter in the #StarWars saga that is choked by its action scenes. In a galaxy far, far away… There was Rogue One: A Star Wars Story. Taking place between Star Wars Episodes III and IV, Rogue is a unique entry into the Star Wars canon. That last word was specifically selected since the film’s subtitle suggests an ancillary or non-canonical Star Wars adventure. Even though Rogue One is an official chapter in the saga, many of its components have conspired to make it seem otherwise. This notion is bolstered by the fact that most of the characters in the film are new to the Star Wars universe and that, for the first time in franchise history, the spotlight has largely shifted away from the Skywalker family. Also, the absence of the Fox Fanfare, the introductory phrase (see my first sentence), the opening crawl and the inclusion of a new title screen (which looks like a cheap knockoff of the iconic golden graphic), all earmark Rogue as an off-format, stand-alone Star Wars film. Additionally, the man calling the shots, Gareth Edwards, is also a newcomer to the series—as well as to directing in general since the only notable film he’s helmed is the God-awful Godzilla (2014). Oh, and lest we forget, an indelible part of what makes Star Wars so magical is the majestic, transcendent music of John Williams. Rogue is the very first Star Wars film to feature a score by someone other than Williams: fresh off of a stint for the other major sci-fi universe (Star Trek Beyond), Michael Giacchino has taken the baton from the maestro. I’ve been critical of Giacchino’s previous efforts, particularly his work for the new Star Trek movie series, so I listened to this score with an extremely critical ear. In my estimation, Giacchino has crushed it like a trash compactor. Giacchino’s orchestrations have captured the essence of Williams’ signature sound (on some cues you’d swear Williams had written the chart) without outright mimicking it, which is to his credit. All of the abovementioned elements have established Rogue’s distinctiveness from the trilogy films which brings us back to that thorny issue of canonicity. Aside from raising concerns over Rogue’s status as a legitimate Star Wars film, the word canon also has a religious application here. In theological terms, Rogue is an intertestamental (between the Old and New Testaments in the Bible) or apocryphal (meaning non-inspired or spurious in nature and not to be included in the canon of scripture) tale. Biblical allusions also extend to the main team of rebels in the movie (which some could argue comes too soon on the heels of that other film about a team of misfits who defended a dusty village from evildoers on a different frontier in the recent remake of The Magnificent Seven). Saw Gerrera (Forest Whitaker) both in function (preparing the way for the rebellion) and appearance, is a type of John the Baptist, while Jyn Erso (Felicity Jones), in the way she gathers disciples for a mission of mercy to save the universe from the tyranny of the Evil Galactic Empire (Spoiler: to say nothing of her ultimate sacrifice), is a type of Christ. The mesa-top community on desert planet Jedha (too similar to Jedi?) also has a religious connection since it resembles the ancient city Masada, a Jewish fortress that was recaptured by the Roman Empire in the first century. Here, Jedha, the site for an early battle in the film, is occupied by a different kind of Empire…one that dispatches its stormtroopers to patrol the streets of the city and maintain order with blasters and tanks. The image of a Star Destroyer hovering over the besieged city is a striking visual that instills a feeling of dread as the citizens below are made to live under the ever-watchful eye of their merciless overlords. The fact that Jedha was filmed in Jordan, part of the Holy Land, further adds to its spiritual mystique. Religious readings aside, the story contains many other aspects that are ripe for analysis. I’ve distilled all of my various opinions and criticisms into three categories: the good, the bad and the ugly. Just for fun, let’s work backwards. The Ugly award definitely goes to the movie’s computer animated visages of two vintage Star Wars characters—one from each side of the Force. Though shot in appropriately dim interiors (which actually helps to veil the artifice), the Dark Side character came out fairly well, despite being a shock to the system at first glance. By contrast, the Light Side character is shot in a bright room and simply looks awful—the effect is similar to dropping CG Tintin (from 2011’s The Adventures of Tintin) into a room full of live action actors. It’s so painfully obvious the character isn’t organic that it sends the audience’s suspended disbelief crashing to the ground and completely ruins the moment, which, incidentally, is the final scene in the film. CG aliens seem to hold up fairly well over time (Jar Jar Binks is annoying as poodoo, but he’s brilliantly realized), but will these CG humans look tackier than they already do as time and technological advances render them more and more obsolete, like the CG characters from the 80s? Leading off the Bad category is our old nemesis…anachronistic technology. Why is it that the creative forces (directors George Lucas, J.J. Abrams and now Edwards) behind each new Star Wars film can’t resist the urge to create new ships and technology, heedless of how that technology may cause aggravating anachronisms, like when R2-D2 suddenly sprouts leg rockets and takes flight in Episode II when no such ability exists in the later films? Here we have obsidian Death Troopers as well as a host of new ship designs, including: U-wing fighters, Hammerhead corvettes and TIE Strikers. Since the events of Episode IV occur directly after this film, where are all of these vessels in the original trilogy? Are we to believe that all of the new ships, on both sides of the conflict, are mothballed the moment the final battle ends? This conspicuous incongruity underscores the same highly criticized issue that plagued the prequels since many of the ships here look newer than the ones in the later films (Episodes IV-VII). Another anachronism involves one of the new droids, K-2SO (voiced by Alan Tudyk), which is essentially C-3PO (Anthony Daniels) on steroids. Whereas Threepio is fussy and loquacious by bent and programming, K2 is a sarcastic sidekick with a malfunctioning tact subroutine. So why is K2 in the Bad category? For starters, K2 is far more advanced than any other droid ever created for the series, including those manufactured decades into the future (like BB-8). Additionally, wisecracking computers (albeit shipboard ones) have been done ad nauseam in sci-fi TV (Red Dwarf and Tripping the Rift) and books (the Star of the Guardians series by Margaret Weis), to name just a few. Shifting back to living beings, the only disappointment in the cast is Whitaker’s Gerrera (a younger version of the character first appeared in The Clone Wars animated series). Not only is Gerrera’s raspy, high-pitched voice annoying and wildly inconsistent from scene to scene, but it makes him sound like he has a thermal detonator shoved up where the sun doesn’t shine (even on Tatooine). Though clearly intended to be a colorful character, Gerrera is a campy caricature, made utterly laughable by a goofy Jamaican accent, finger-in-a-toaster coif and mock earnest dialogue (his line “What will you do when they catch you?” sounds like an alternate lyric for the main theme of the Cops TV show). Gerrera’s cartoony characterization is an egregious waste of Whitaker’s time and talents—after all, he is an Academy Award-winning actor (The Last King of Scotland). Now seems like an appropriate time to ask why so many characters in the Star Wars universe have asthma? Vader, Grievous and now Gerrera, all have respiratory issues. And while waxing nitpicky, why did Galen Erso (Mads Mikkelsen) make his design flaw inside the Death Star so difficult to exploit (only someone strong with the Force can accomplish the task)? Instead of putting pilots through the trouble of maneuvering down a narrow trench, avoiding turret fire, evading speedy TIE fighters and launching a proton torpedo into a two meter wide exhaust vent, why didn’t Galen just program a virus that could cause a cascade failure inside the Death Star? Thanks for nothing, Galen. Rogue is replete with such plot contrivances, all of which are designed to shoehorn this film into the extant film series. In fact, the entire narrative is a Dune style planet-hopping scavenger hunt where (hypothetically speaking) the team has to pick up an item at Planet A and plug it into a device found on Planet B in order to receive a transmission from Planet C, etc. Though this intergalactic pinball game plot is tedious, it does bring back the excitement of having a good old-fashioned adventure in a wide-open universe, plus it’s a real thrill to see the origins of the MacGuffin that was so vital to the storytelling success of Episode IV. And finally, the Good (or merely acceptable). Aside from the inane portrayal of Gerrera, the movie’s performances are solid down the line. Mikkelsen is a tremendous actor known for playing heinous villains (Casino Royale, Doctor Strange and the titular cannibal in TVs Hannibal) who is cast against type here as a conflicted scientist. Much like his role in Strange, Mikkelsen delivers a memorable performance despite limited screen time. Chirrut Imwe (Donnie Yen) and his loyal sidekick Baze Malbus (Wen Jiang) provide plenty of comic relief in the film and are essentially flesh-and-blood versions of droids R2-D2 and C-3PO (who make a brief appearance here), which are based on the main characters in Akira Kurosawa’s The Hidden Fortress (1958), a film that greatly influenced George Lucas’ screenplay for the original Star Wars (1977). Jones (The Theory of Everything) brings the optimal mixture of vulnerability and pluck to the lead role of rebel upstart Jyn, Galen’s daughter. However, due to her cursory back story, Jyn (the second female lead in a row for the franchise, which was surely mandated by diversity-embracing Disney), is a far less effective leading lady than Rey (Daisy Ridley) from Star Wars: The Force Awakens (2015). For proof of this, look no further than Jyn’s Aragorn style, pre-combat speech, which fails to inspire because we barely know her and she barely knows her team. Since the plot is merely a chain of episodes where characters run around shooting things in meaningless action scenes, there’s little emotional investment on the part of the audience (indeed, the story left me largely unmoved). The movie’s dearth of significant background details on the motley team of rebels has forged an ensemble of disposable characters—they serve their function in the story and then are thrown aside in the most expeditious and contrived manner conceivable. Spoiler: Even though none of these characters show up in the original trilogy, why was it necessary for all of them to die? Couldn’t some of them have survived and continued to serve the Alliance in supporting roles during the Battle of Yavin and beyond? And speaking of the first Death Star assault, clips of some of the pilots from Episode IV are woven into this movie’s climactic space battle. Though these excerpts are clever Easter eggs for diehard fans, they do become gimmicky from overuse. One of the new faces seen during the cosmic conflict is that of General Merrick (Ben Daniels), an ace pilot who adds some panache and humor to what could’ve been just another “Stay on target” dogfight. Other familiar faces from the Episode films appear here, including: the appropriately aged Bail Organa (Jimmy Smits), the slightly younger Mon Mothma (Genevieve O’Reilly) and the different face, same beard General Dodonna (Ian McElhinney). Intertextual nods to the other Star Wars films abound here, like Galen’s “Help me Obi-Wan” style holographic message and the recurring gag line, “I’ve got a bad feeling about this.” The planet concepts in the film, especially Nordic Grange and tropical Scarif, are among the finest ever conceived for the series. After considering all of Rogue’s pros and cons, the movie’s success as an entertainment comes down to its thrill ride finale. The typical movie ending features a wrap-up after its climactic events. As an exception to practically every movie ever made, Rogue sustains its pulse-pounding action right up to the last scene since everyone who’s seen Episode IV knows exactly how this movie will end. 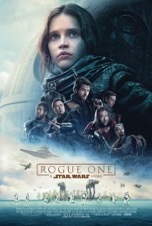 As such, the last five minutes of this film are guaranteed to leave you gasping for air, which is ironic since one of the ongoing themes in the film is labored breathing; be it Gerrera’s reliance on a respirator or ambitious Krennic (Ben Mendelsohn) finding himself on the wrong end of a Force choke. It’s fitting, then, that for all its flaws and inconsistencies, Rogue is a breathtaking film. So now it’s time to head back to the future for next year’s Episode VIII. See you in line.